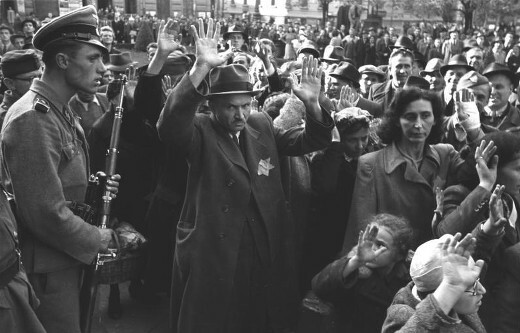 On October 15th of 1944, with support from Nazi Germany, the far-right Arrow Cross Party took control of Hungary and immediately began to kill large numbers of Jewish citizens. Thousands more were deported to Auschwitz. The following farewell letter was written the next day by 17-year-old Budapest resident Pinchas Eisner to his brother, Mordechai, who at the time was in a forced labour camp. Weeks later, on November 3rd, Pinchas was marched to a local forest with 70 other Jews, told to dig a mass grave, and then shot to death. The letter was discovered by Mordechai some time later upon his return to the family home. Goodbye! Think of our talk that night. I felt as one with you. I knew that, if it were you whose life would end, I would go on living as if I had lost half of my body and soul. You said that, if I die, you will kill yourself. Think of what I told you, that if you stay alive I will live on within you. I would have liked to continue my life, with you and with our family. Plans, desires, hopes were before me. I longed for the unknown. I would have liked to know, to live, to see, to do, to love… But now it is all over. In the city, Jews were exterminated from entire streets. There is no escape. Tonight or at least tomorrow it will be our turn. At seventeen I have to face certain death. There is no escape. We thought that we would be exceptions, but fate made no exceptions. I always felt the pull of the depth, about which I have written to you…I believe, I also felt, that I would die young. It seems like fate put a curse on each of us. After Yisrael it is now my turn together with my father, mother and sister. I hope you will survive us. Farewell and forgive me if ever I have offended you. (For the first time my eyes begin to fill with tears. I am careful not to cry as there are others present.) Because I loved you and I see you as you smile, (the vein on your brow is swelling) as you are thinking, as you eat, as you smoke, as you sleep and I feel great tenderness, great love and my eyes are filled with tears. Farewell. Live happily, all the best to you my dear brother, lots of success, much love and happiness, don’t weep, don’t cry. (I felt so bad hearing you cry that night.) Think of me lovingly. Remember me with good heart and, if there is another world (how much I discussed it with you, too – now I’ll find out! My poem ‘What Will Happen to Me?’ comes to my mind…I felt it already then), then I will pray to God to help you in whatever you do. Farewell, my dear only brother! If you are interested to know my state of mind (you see I am thinking of this, too) I will try to describe it and also that of our home. The calamity started last evening. By nightfall, the Jews of 64 and 54 had already been taken away. There was a pool of blood on the pavement, but by morning it was washed away. I was awake the whole night. R.J. and K.S. were here. Poor R.J. could hardly stand on his feet he was so full of fright. At first we hoped that the police and the army would protect us, but after a phone call we learned everything. Slowly morning arrived, but the events of the day made our situation hopeless. K.S. came at 6. He was about to faint after he fought with four Nazis who beat him terribly. He barely escaped with his life. He was stumbling and trembling and could not start talking because of what he had seen and been through. I write fast, who knows if I will have time to finish? K.S. offered to take Sorele to a safe place. She promptly jumped at the suggestion and wanted to go immediately. But Mummy stepped in front of her and with a completely calm voice said that she would not let her go because the Nazis might catch them on the street. Sorele was crying and hysterical. She wanted to go, she wants to live. Finally Mother proposed that if I go too then she will give her consent. You should have heard the way she said that. Sorele wanted to go, I stayed…I could not leave our mother and father. (Do you remember our discussion about hiding in the safe hide of a bear? It came to my mind at once.) So mother did not let Sorele go and K.S. did not force it any longer, he, too, stayed. Sorele cried and screamed, Father was praying the whole night. He still has some hope left, but he is talking about this world as being like a vestibule to prepare ourselves for the real world to come. Mother and Father are telling religious parables to K.S. about the inevitability of destiny. Mathild is sitting next to us and listens. Sorele is outside and I am writing. I am relatively calm, facing death my thoughts are coherent. (Yesterday at dawn I even wrote a steno-composition, you might find it in my notebook.) It is not fear that I feel but the terribly considered bitter and painful realization of things to come. I hope I’ll get it over with quickly, only it will be terrible to see each other’s agony. God will help us and we will be over it. Farewell, dear, sweet Brother. Farewell! Remember me. I hope that I, too, will be able to think of you even from over there. I would like to hug and kiss you once more. But who knows to whom I write these lines? Are you alive?! Farewell, my dear brother, my sweet Mordechai, live happily.